Oatmeal - Breakfast in a bottle! 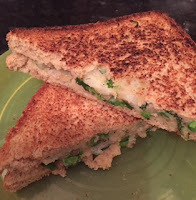 This is again another healthy breakfast recipe I tried yesterday. I got the motivation from Pavithra's Facebook pictures. Oatmeal is my almost everyday breakfast. I will just fill the one minute oats in a box and take it along to work and cook it there and eat it along with 6 or 7 almonds. Now a days after so many beautiful pictures of mason jar breakfast ideas online, I really wanted to try making my own mason jar breakfast. When I was in the middle of filling the bottle, my girls got curious and wanted to make their own breakfast bowl. I used an empty honey bottle to make this dish. Here is what I did. I got the motivation for making these bars from Pavithra. 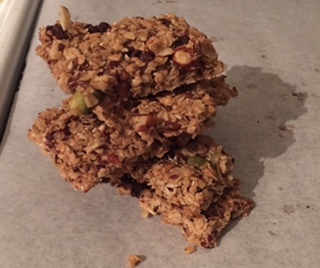 I have bookmarked couple of granola bars from her blog and wanted to try for a long time now. This weekend, I somehow managed to find time to make this. This did not take that long to make. Here is what I did. This is a very easy breakfast recipe I made for my girls. 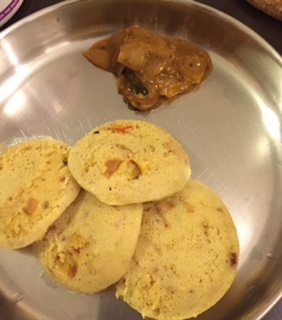 If you have Idly batter ready, it will just take less than 10 minutes to prepare and 10 minutes to steam the idly. Here goes the recipe. This is just a review post. 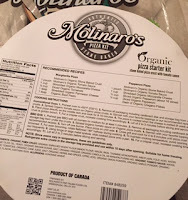 We bought this Molinaro's stone baked organic pizza kit from Costco. I thought of writing a simple review for the product. 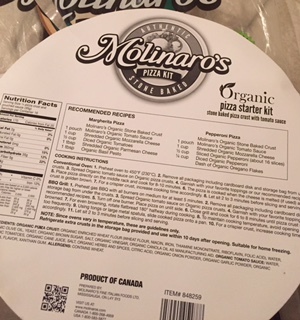 I have used Pillsbury pizza crust before and tried once. But this is the first time where I am using an already baked pizza crust. The goal for this new year is to use very less sugar in whatever I bake. While going through many sites, I came to know that honey can be substituted as sugar along with fruits which are naturally sweet. I tried this muffin recipe this weekend and it came out spongy. I took the basic banana peanut butter recipe from allrecipes.com and changed the ingredients according to this muffin. Here goes the recipe. My first post for this year and happens to be a simple and easy sandwich. I made this yesterday for my girls. It took less than 10 minutes to finish it and give it to them as after school snack. Here goes the recipe.